Remove all visible fat from the meat. On the stovetop, heat 1 teaspoon oil in a large Dutch oven on medium-high. Salt & pepper the meat and brown both sides. Use tongs to turn the meat, adding another teaspoon of oil. Good browning takes about 10 minutes. Remove meat from pan to a bowl. Reduce heat. Add 1 teaspoon oil and sauté onion & garlic 2 minutes until golden, stirring well to scrape in all the drippings. Add hot stock and meat, stirring & scraping well. Once the mixture boils, cover and place in oven. Bake for 1 1/2 hours. Remove from oven, stir in vegetables, cover and return to oven for 45 minutes. About halfway through, stir and add more stock if needed. Taste for salt before serving. Slice or shred meat and pour juices over. 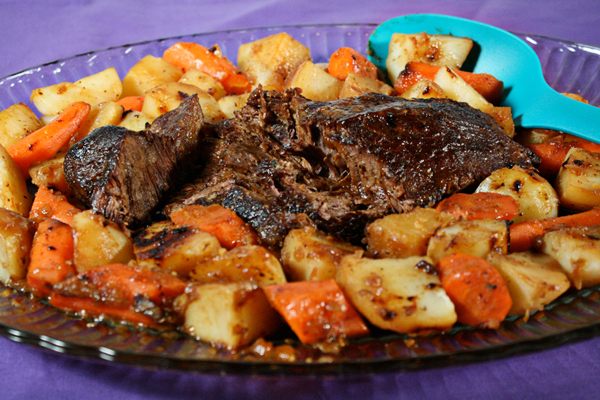 27 Comments on "Easy Pot Roast"
I made this and it was the best pot roast I have ever made. I have bought the pouches for pot roast, but this by far was the best. I will continue to make this one as it was so delicious and tender. Have tried some other recipes and willl be trying more. I too am of Polish descent and loved the paczki recipe. Another winner from Jenny! My 6yo son has severe allergies and a fairly restricted diet and this is one of his favorite dinners – simple and delicious! I read some persons added mushrooms to this delicious dish. When do I add them? I usually have canned sliced mushrooms on hand, but I would like to know when to add fresh & when to add canned mushrooms. So this sounds like an add in I would like to try. Thank you for sharing your recipes & love of food. I just started making bread – I’ve never made bread before. …and for some reason & to my surprise ~ I’m really loving it! Hi you can add the fresh mushrooms when you add the other fresh vegetables and the canned mushrooms you can add (drained) about 15 minutes before the roast is done. You just need to heat these through. YOU MAKE A LOT OF PEOPLE HAPPY. THANK YOU. My new go-to pot roast recipe! I added fresh mushrooms… delicious. I’m planning to roast an 8 lb. Chuck Roast. Should I extend the cooking time? I have an eye of the round roast, would I cook it the same way??.. I have an eye of the round roast. Do I cook it the same way??.. If I used sweet potatoes, would I need to change anything such as cooking time? Or do you not recommend sweet potatoes? Thanks!! Just finished making and eating this roast and it was delicious!! I added mushrooms and they absorbed all that beef juice.. thanks!! Added some spices that added a lot..
Love your cooking. Every thing I try turns out so great. This recipe was easy to follow, no crazy extra ingredients and turned out to be delicious. After I had browned the roast, I realized I was out of potatoes. I did however, have sweet potatoes so I put those in with my carrots. I was very pleased. Thank you for sharing this recipe. I don’t know but I’m guessing the cooking time would not change. Hello – I am a little embarrassed to ask but really want to try this recipe. What is beef chuck? I didn’t see this in the store, unless there is another name? I’m not very familiar with cuts of beef but I believe a rump roast would be similar, but it’s best to ask a butcher to be sure. A chuck roast is a specific cut of beef roast that is more tender than a rump or shoulder roast. Beef Chuck roast is a cut of beef that has a fair amount of marbling (fat) running through it. The fat helps tenderize the mat as it cooks. You can buy it with the bone in or without. It is a very versatile cut of beef. Serve it as a roast the first meal then hat and shred the leftovers for roast beef sandwiches another meal. Very tasty! I will have to save this recipe. Thanks! This dish has been a staple for my family for years. My “babies”, 24, 26, & 28 still ask good ole mom to make it monthly. The BEST memories always come from food. I LOVE IT !!! Simple and delicious! I used a larger piece of chuck but followed the rest of the recipe as written.